Does Valentine’s Day have your heart fluttering because you haven’t found your love the right gift yet? Don’t panic: Make a gift yourself! After all, there is nothing like a homemade gift to show your sweetheart you have been thinking about them. Maybe you have never made a homemade gift and the thought of it summons up pictures of awkward grade school construction paper cards; perhaps the opposite is true and you think of Pinterest creations that had to have been made by trained professionals. There are several easy, attractive, and affordable gifts that you can make within a day. From romantic to fun, there is something for every valentine on your list. “Two Little Lovers Sitting in a Tree” is the ultimate in romance and just may bring a tear to your lover’s eye. This piece of home décor features a framed tree with two hearts hanging from it. The touching twist is that the tree is cut from a sheet of your wedding song lyrics. A special poem, song, letter, or other sentimental written item would do just as well, I’m sure. The tree is mounted with puffy square adhesives, giving it a 3-D effect, and the hearts are mounted outside the frame. This tutorial even gives a template for cutting out the tree as well as detailed instructions and tips for the rest of the project. You will need paper, a computer and printer, mounting squares, twine, and a frame. If you are anything like me, you spend hours admiring fancy cookies and cupcakes online and several more hours attempting to re-create them unsuccessfully. Well, these sweets are fun to make and fun to eat. For these goodies, you will need chocolate chips, pink wafer cookies, strawberries, an assortment of Valentine’s Day sprinkles, and parchment or waxed paper. You may want to use white chocolate as well. For the cookies, simply melt the chocolate in the microwave, then dip half of the wafer in. Put the sprinkles on before the chocolate hardens, then place wafers on waxed or parchment paper to dry. 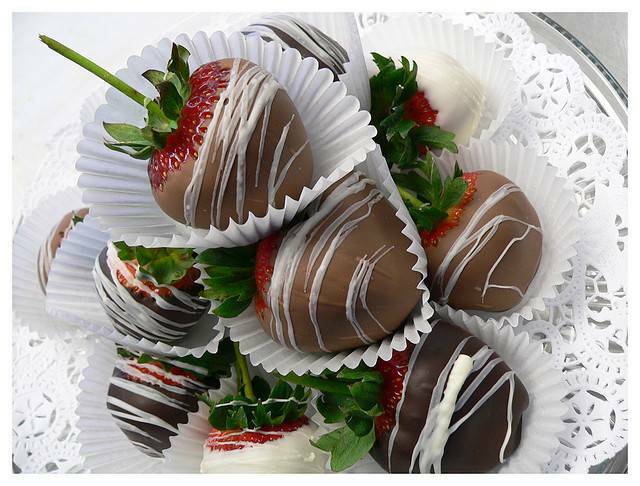 The process is the same for the chocolate-covered strawberries, but be sure to wash your berries first. Since the strawberries are a little more elegant, you may want to use candy pearls, nuts, or a chocolate drizzle to decorate the berries after dipping. Package some of these treats nicely and they make fantastic gifts for anyone. This one is for the kids and the kids at heart. I have never known a kid who wasn’t captivated by the paint samples at the store. Now, there is a reason to actually take the samples home and make something, and it’s free, mostly. To make this paper punch heart garland, all you need are paint samples, a heart paper punch, a needle, and some thread. Let the kids punch hearts out of the different-colored paint samples, then an adult can sew them together to make a garland. Use the garland to decorate mirrors, windows, and walls. Or just use the little hearts to glue onto Valentine’s Day cards. And the strips of paint chips that have the hearts punched out make great bookmarks once a tassel or some twine is attached. All of these items make great gifts for teachers, grandparents, parents, and siblings. Switching gears now, here is a gift for that difficult-to-buy-for adult who may not appreciate the traditional Valentine’s Day gifts. Although I have labeled this section “Beer Bouquet,” you can use any type of alcohol, from expensive fine wines to inexpensive beers to vodka. The tutorial shows a large beer mug filled with Styrofoam at the bottom and stuffed with decorative paper. Sample-size bottles of liquor are hot-glued to wooden skewers, which are then arranged in the Styrofoam. These are great when you have more than one person to buy gifts for. You could also choose to use full size bottles and arrange them in a bucket with some flowers or balloons, or you could make a gift basket. Tuck in some candy or jerky on skewers as well, or some other things your valentine likes. I especially love the decorative containers with chalk-paint labels that you can use to write a special Valentine’s Day message to your loved one. For the valentines who do enjoy traditional gifts, a candy-filled vase with live flowers is a sweet and pretty gift. You will need two clear glass vases of the same shape but different sizes. The smaller will need to fit inside the larger with some room between the two. You will also need your choice of Valentine’s Day candy and some fresh flowers. Simply put the smaller vase inside the larger one and fill the space in between with candy. Red Hots, conversation hearts, and Valentine’s Day M&Ms are a few good ideas. Fill the inner vase with water and put the flowers in. You could further decorate the vase with Valentine’s Day ribbons, burlap, or lace. This vase of flowers is as good to look at as it is to eat! A submerged bouquet with candles makes a nice gift for couples enjoying a romantic evening together. Roses are perfect for this arrangement, but tulips, orchids, and lilies are some other beautiful choices that will work well. In addition to the fresh flowers, you will need several clear glass vases of varying sizes, floating candles, distilled water, craft stones, and lead weights, which can be found in stores with fishing supplies. I like to group several vases together for an attention-getting display or “bouquet,” but you can use as many as you like. Attach a lead weight to your flowers as shown in the tutorial to keep them from floating up. Then, cover the bottom of the stems and the weight with craft stones of your choice. 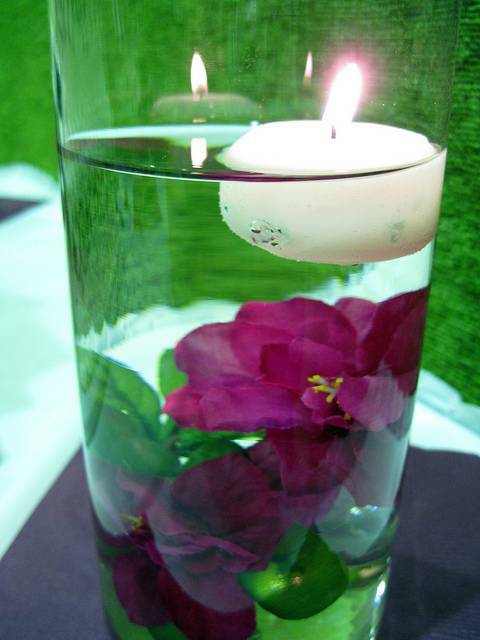 Fill vases with distilled water, and float a candle at the top of each vase. I like to scatter rose petals around my arrangement as well.